A leaving group is a nucleophile acting in reverse; it accepts a lone pair as the bond between it and its neighbor (usually carbon for our purposes) is broken. So what makes a good leaving group? The “happier” and more stable that lone pair is, the better a leaving group it will be. The most predictive rule for leaving group ability is…. Good leaving groups are weak bases. Think about the dissociation of an acid H–A to give H+ and A– . The species A– is the conjugate base of HA. It accepts a pair of electrons from the H-A bond. It’s a base acting in reverse. The more stable A- is, the greater the equilibrium constant will be that favors dissociation to give A- . This turns out to be the very definition of acidity! The negative log of the equilibrium constant is the familiar pKa. In other words pKa is a direct measurement of how “happy” and stable a lone pair of electrons is – the very definition of what we should be looking for when trying to quantify leaving group ability. So it should be no surprise to find that very weak bases such as halide ions (I-, Br-, Cl-) water (OH2), and sulfonates such as p-toluenesulfonate (OTs) and methanesulfonate (OMs) are excellent leaving groups. These are the conjugate bases of strong acids. (Recall that the stronger the acid, the weaker the conjugate base). On the other hand, strong bases are bad leaving groups. This is why alcohols don’t participate in SN2 reactions very much! the hydroxyl group (HO-) is a terrible leaving group. If you’re not sure where a reaction is going to happen on a molecule, look for a good leaving group. That’s usually where the action is! The trend is pretty clear – in general, the weaker the base, the better the leaving group. Furthermore, note how we (almost) never see alkanes or hydrogens as leaving groups. That’s because they’re strongly basic anions – and very unstable. You might note that I have carefully avoided discussing fluorine. Fluorine tends to be a very poor leaving group for SN1/SN2/E1/E2 reactions. In Org 2, you may see some examples where F can act as a leaving group when it is attached to a carbonyl carbon or an aromatic ring. 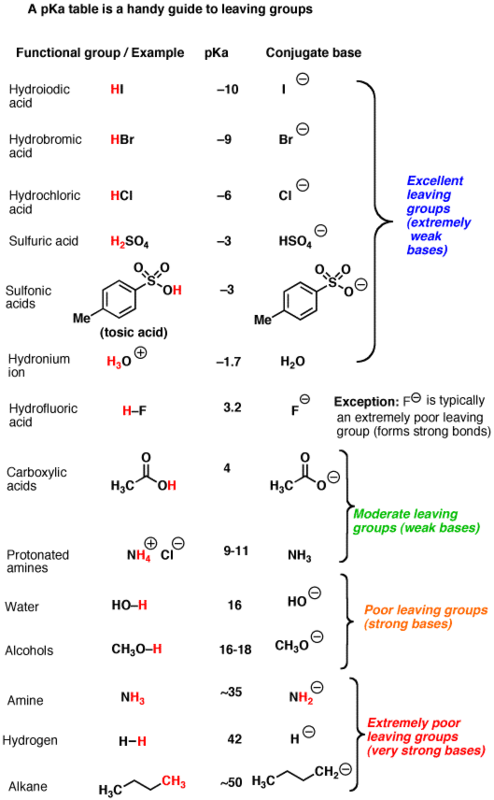 These reactions (addition-elimination reactions) are a little bit different in that the rate determining step is not so related to loss of the leaving group. There are some extra factors at work in these situations that we can discuss if you’re curious. Awesome! This clarifies a lot! Thanks!! I love your site!!! I have been on this more than my text, increasing my quiz score. you’re too awesome, thnx a million! Which is the good living group phenoxy ( PhO) or chloride (Cl)? Which is the good leaving group phenoxy (PhO) or Chloride Cl? Procedure for you figuring this out for yourself: Go to a pKa table and figure out the pKa of Phenol (PhOH) and HCl. Which is a stronger acid? Now: the stronger the acid, the weaker the conjugate base. . So which of these would have the weaker conjugate base? The weaker the base, the better the leaving group. phenol has a pKa of about 16 and HCl has a pKa of about -5 so “strong acid weak conjugate base” would imply that Cl- is the better leaving group. how did you get through general chemistry not knowing that?! phenol at about 10 pka, HCl at about -7 pka. So HCl is the stronger acid=weaker conj. base = more stable as an anion = better leaving group. Do I have this thought process correct? The most understandable way I have ever seen! Thank you very much, please keep up the good work. Thank you so much. Very lucid and informative. Please keep it up. Yes, please discuss the extra factors you mentioned regarding F- in a-e rxns. Thanks so much for always making it clear and interesting! What happens if the leaving group is positive, making the charge on the carbon neutral, like S+(CH3)2? This is just what I need,Organic chemistry has been a part of chemistry that seemed to be impossible to understand. But with the help of your explanations I see my self getting a straight A,beyond the shadow of doubt. Thanks to you James. this is a great website, veyr helpful and much clearer than my text or the professor. thank you. Thanks for this amazing resource to help me through orgo. It’s people like you who need to be in Universities teaching students because anyone can see based off this website you’ve made, that you actually care about the people learning and understanding orgo….thank you. Just wanted to say thank you. Wish I had found this website months ago. All the information is so accessible and very well organized. Keep up the tremendous work. You’ve gained a loyal visitor to your website. I’ll be back next semester for organic II as well. This website is so useful! Thank you very much! There is a mistake in the second paragraph, I think. An atom can never be neutral and charged at the same time. A neutral atom’s atomic number(number of protons) is the same as the number of electrons. I recommend you to say an atom becomes an ion(negatively charged) to reach the full octect. No he means it BECOMES charged when the electrons move onto the leaving group. I don’t think there’s a mistake. keep up your good work. your site really helped me and my friends most of the concepts in organic chemistry. Thanks! But can u explain plz why weak bases are better leaving groups? Weak bases are very stable as anions in solution on their own. A weak base has a strong conjugate acid (e.g. HCl is the strong conjugate acid of the weak base Cl-). In the acid, you can think of the base as being a “leaving group” that allows the H+ to go off on it’s own (Like Cl- rapidly leaving H+ in aqueous solution). Since the acid is strong, we know that the base must very readily leave. Conversely, if the acid is weak (like CH3COOH), we know that it holds the H+ relatively tightly. The base (CH3COO-) is relatively unstable in solution, so it doesn’t want to leave the H+. It’s very similar when that same base is attached to a carbon skeleton. Cl will leave the carbon skeleton readily because it’s fairly happy just being Cl- in solution, whereas CH3COO- is not so happy to do so. Moderately strong bases, like NH3 are poor leaving groups, and strong bases like OH- are terrible leaving groups. If you take a very strong base like CHC- (acetylide) it will never leave, so we don’t even consider that a leaving group. Where would O-Ph rank as a leaving group? Is it better than the halides? the site is excellent, thank you very much, you had solved most of my problems in organic chemistry. By far the most coherent explanation of nucleophiles and leaving groups I have seen so far. Better than Youtube and most text books for that matter! What if there are two identical leaving groups on different parts of the molecule? Say, two bromines. What factors do you look at when choosing the leaving group then? Then you would examine the carbon that the leaving groups are attached to. Primary, secondary, or tertiary? Then you would look at the reaction conditions (i.e. what nucleophile is present?). This then leads into the SN1/SN2/E1/E2 decision. You might want to check my “Quick N’ Dirty Guide to SN1/SN2/E1/E2 for more information there because it’s a lot to summarize in a blog comment. Minor fix needed on the first image: the reactants side is neutral while the products side is positive (need to either add a negative formal charge to Nu or take off the negative formal charge from L). Could u explain why F can become a leaving group when it is attached to a carbonyl carbon or an aromatic ring? Yes, F- is an OK leaving group in those situations (nucleophilic aromatic substitution) because the rate limiting step is attack of the aromatic ring (disrupting aromaticity). Loss of the leaving group is slow compared to that step. Also, because F- is so electron withdrawing, F actually helps to accelerate the reaction by removing electron density from the ring and making it easier to attack. I- is a BLG than F- in aprotic solvents. F- is a BLG than I- in protic solvents . If something is a poor nucleophile it has to be BLG. I am right , right ? asking this because I read poor bases are BLG which I accept ,but I think that it should differ in solvents. someone please tell me if I am right or not. These articles really help. Continue the good work. Cheers from India ! +NR3 is the best leaving group. Could you please explain the fluoride ion exception? Oh. My. Goodness. This is absolutely amazing. I will never be able to thank you enough or express how much this has helped me. Seriously, you are a god in my eyes right now. Awesome website, explains the any topic with ease. Whenever I have any doubt I refer MOC, it helps me a lot. Thank you Mr. James for your remarkable efforts. You have made learning organic chemistry interesting through this website.